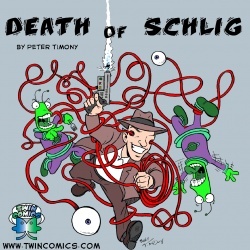 Death of Schlig (Peter Timony; 01-Oct-2011; Glulx). Other contributors: Peter Timony (story) and Bobby Timony (story and cover art). IF Comp 2011: 26th place of 38 entries. Death of Schlig - at IFDB. Death of Schlig - at ifwizz interactive fiction (in German). This page was last modified on 25 June 2016, at 13:03.